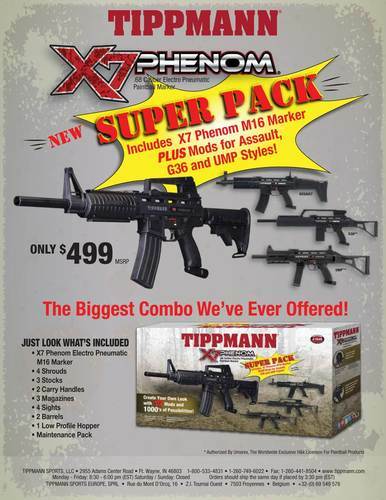 The Tippmann X7 Phenom paintball gun with FlexValve Technology is the first electro-pneumatic paintball marker to offer the combination of improved air efficiency, superior accuracy, manual or electronic mode firing, and the flexibility of CO2 or compressed air usage. The new FlexValve operates below 300 PSI for improved air efficiency allowing you to get over 1,400 shots from a 68 cubic inch 4500 psi tank. Also, due to its Spool Valve design, recoil is virtually eliminated for improved accuracy. Players have never been offered such a complete package the performance of a tournament marker... the flexibility of a mechanical marker... the durability of a Tippmann... and the ability to customize their marker with thousands of different looks. With the new X7 Phenom priced similar to the current X7 with eGrip, the X7 Phenom truly is in a class of its own.